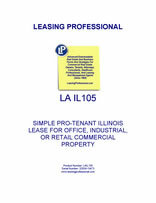 This form is for a single tenant Illinois lease where the tenant has superior leverage. It gives the tenant the right to use the premises for "any legal use," and has very abbreviated remedies for the landlord in the event of a tenant default. It is also pro-tenant in character because of the clauses it does not contain which customarily appear in pro-landlord forms relating to remedies and a variety of other pro-landlord provisions. Illinois, home of North America’s tallest building, finds its major sources of business in agriculture, cattle farming and mining. Illinois is ranked fourth in the nation as the home for the headquarters of the largest United States companies: thirty-five such corporate headquarters are located in Illinois. Chicago’s O’Hare Airport is the world’s busiest, as well as Business Traveler Magazine’s best airport in North America, for six years in a row.